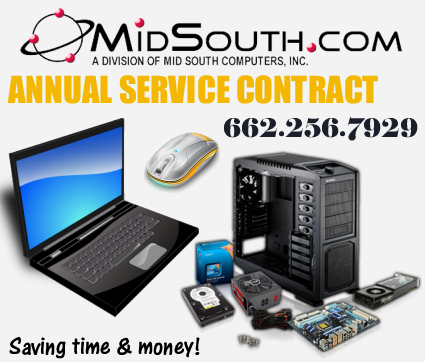 Did you know that having an annual computer maintenance contract with Mid South Computers can save you time and money? We can check your PC or Mac for viruses, Spyware and ad-ware and remove any potential problems. We can improve the performance of your PC or MAC by the simple un-installation of unnecessary programs that run in the background of your computer taking up valuable resources. Plus much more. We will keep the latest virus removal software on your system, and also keep all the cooling fans and internal parts cleaned for maximum performance to extend the life of your computer. Protecting your investment and making sure your PC or Mac runs optimally. All of this for a very reasonable annual fee. *AMC does not cover faulty hardware, or self created computer user problems. You will have unlimited phone and email support during your contract period to one of our IT Techs. This support will be available Monday through Friday from 9:00am to 5:00pm, excluding holidays. A lot of computer problems can be solved this way. Help will be just a phone call or email away. We will install the necessary virus and malware tools on your computer to keep it virus free. This software is included at no additional charge to AMC holders. We save you money by providing the software for your computer to you and removing any viruses or malware problems at no additional cost. You will be eligible to bring your computer in to our shop for a checkup once every 30 days. This will give our techs the chance to make sure all of your virus software is up to date, the cooling fans in your system are free and clear of obstruction, as well as remove and clean any un-necessary items you may have running on your computer that may be causing performance related issues. We'll make sure your computer is up to speed and performing the way it should. If you purchase new hardware or software for your computer during the contract period we will install it and set it up free of charge for all AMC contract holders. Giving you the ability to relax and know your new hardware or software is being installed and set up by IT professionals. Printers, scanners, cameras and computer accessories are included in this. You won't have to worry about figuring out how to install your new hardware or software. We'll do it for you.